Today I am thrilled to welcome to the blog Sharon Ledwith, author of The Last Timekeepers and the Arch of Atlantis from Euterpe Books, the YA/MG imprint of Musa Publishing. Sharon is here with us today to celebrate Euterpe's Back to School Extravaganza week. In getting to know Sharon, I've discovered that she's a writer after my own heart, sharing my love of research and a draw to the older myths and folklore. 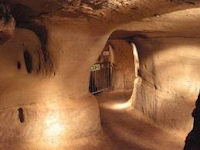 I love the fascinating information she gleaned on the caves of Nottingham, perhaps because there's some striking similarities between them and the caves and underground cities of Cappadocia, Turkey, that I'm using in one of my stories. So, please welcome Sharon to the blog, and I hope you enjoy learning more about this hidden gem of Nottingham's history. In my middle-grade/young adult time travel book, TheLast Timekeepers and the Arch of Atlantis, my feisty group of adolescent characters’ first mission lands them in England in 1214 where they must find a young Robin Hood and his merry band of teens. Legend has it that one of Robin Hood’s haunts (besides the famous Sherwood Forest) was the village of Nottingham. 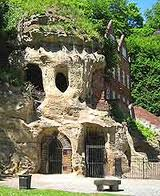 When I undertook the meticulous research needed to craft my novel, I came across an interesting fact about Nottingham I had never known: beneath the houses, shops, and offices of Nottingham are hundreds of caves. My eyes bugged and imagination went into overdrive, while I gathered fact after fact about the Nottingham caves. In truth, it was a little like panning for gold nuggets. Throughout the medieval period Nottingham continued to grow and prosper, becoming a centre for trades such as wool manufacture, tanning, malting, alabaster carving and pottery production. A number of these activities were undertaken in Nottingham’s caves. Susan here -- Thanks Sharon so much for sharing some of your research with us. 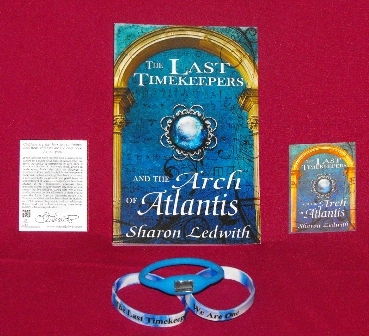 To celebrate our Back to School Extravaganza, Euterpe Books is giving away one copy of Sharon's ebook, plus Sharon has offered a prize package that includes a signed paperback novel of The Last Timekeepers and the Arch of Atlantis, a trading card, two wristbands (adult and youth size), and an Ionic Power wrist watch. To enter, all you need to do is comment before Sunday evening. I'll draw a winner for the book and the prize package on Sunday night (9/16) at 7 pm EST Extended to Monday night (9/17) at 10 pm EST! We'd love to hear about your research. What's some interesting tidbits you've uncovered researching for a story? Or, has your research ever inspired you into a whole new story than what you had planned? From time to time on this blog, I've looked at various Harry Potter characters and analyzed which archetype they fit. Harry, we know is the hero. Fluffy serves as a Threshold Guardian. Fred and George are Tricksters. JK Rowling uses many Heralds throughout the series. And Snape is the perfect Anti-Hero. But it wasn't until a writer in the last workshop I presented at Savvy Authors asked me what Neville's role was that I realized he was the perfect Foil. The role of a Foil is to contrast and compare with another character in order to show similarities and distinctions. Neville provides this service for Harry. Born on the second to last day of July, orphaned emotionally if not physically by Voldemort, and brought up by a grandmother who is not exactly the warm, mothering type, Neville is just a shade off of Harry's own journey. But whereas Harry quickly finds his place on a broom and the Quidditch pitch, Neville, with his self-doubt, lack of coordination, and memory problems has a harder time finding his way. 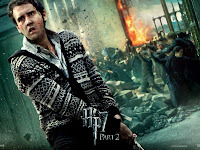 For the first 3 books, Neville serves primarily as a contrast to Harry, essentially making Harry look better, but also occasionally showing him up. Neville is the only one that stands up to Harry, Ron, and Hermione at the end of PS/SS when they are about to go it alone again, breaking all kinds of rules, and losing more points for Gryffindor. It is in Goblet of Fire, due to the duplicitous help of Pseudo Mad-Eye that Neville's strength and knowledge comes more into the limelight as his knowledge of magical plants helps Harry triumph in the second Tri-Wizard challenge. His character truly starts to shine in OotP where he is one of the first to state his loyalty to Harry after the Daily Prophet's smear campaign. Neville becomes an important member of Dumbledore's Army, remaining the last student standing besides Harry in the battle at the Ministry. And, of course, who can forget that it was Neville who sliced the head off Voldemort's last remaining Horcrux by beheading Nagini with Gryffindor's own sword? A sword he won by standing up all alone to Voldemort's flaming attack and refusing to join Voldemort's side -- just as Harry did in his first year. 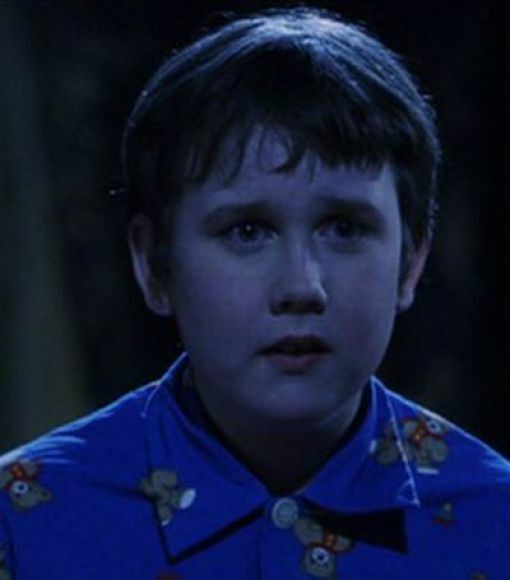 Neville has gone from being a lost, unpopular child, falling off his broomstick, to being "The Man," the one who stayed at Hogwarts and defied the Death Eater's regime, learning the full secrets of the Room of Requirement, and thus providing an entry port for Harry into the final battle. Neville was an excellent Foil, but one who did not exist merely to define the hero. JK Rowling gave this foil his own hero's quest, which while secondary to the series' protagonist's, still left his fans cheering. Have you written a Foil into your story? What aspects of your protagonist did your Foil serve to compare and contrast? Also, please join me Friday for a special blog post from Sharon Ledwith, author of The Last Timekeepers and the Arch of Atlantis, from Euterpe Books. Euterpe is celebrating our Back to School Extravaganza this week with a blog fest, free books, and a special book club package giveaway. As part of this celebration, I'm also blogging today at Jami Gold's place with a post on Small Publishers: Tips for Success. Hope you will join our fun!